Close up of Zhuozheng Garden in Suzhou. Suzhou (Simplified Chinese: 苏州; Traditional Chinese: 蘇州; pinyin: Sūzhōu; ancient name: 吳) is a city on the lower reaches of the Yangtze River and on the shores of Lake Taihu in the province of Jiangsu, China. Called the cradle of Wu culture, Suzhou is the oldest town in the Yangtze Basin, founded in 514 B.C.E. With the completion of the Grand Canal during the Sui Dynasty (581–618 C.E. ), Suzhou found itself strategically located on a major trade route. That marked the emergence of Suzhou as a center for trade and commerce. Suzhou has been an important center for China's silk industry since the Song Dynasty (960-1279), and continues to hold that prominent position today. Suzhou reached its golden age with the Ming Dynasty in 1368 C.E. 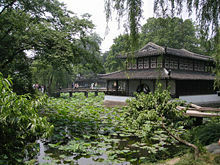 During the Ming Dynasty, and the Qing dynasty which followed, aristocrats constructed many of the famous private gardens. From that period, the city has won renown for its beautiful stone bridges, pagodas, and meticulously designed gardens. By the end of World War II, many of the gardens lay in ruins. The Chinese government launched a project in the 1950s, to restore the gardens to their former glory. In 1981, the provincial government listed Suzhou as a historical and cultural heritage site, assisting Suzhou in becoming one of the most prosperous cities in China. The GDP per capita reached ¥79,406 (c. US$10,087) in 2006, ranked number fifth among 659 Chinese cities. UNESCO designated the Classical Gardens of Suzhou a World Heritage Site in 1997 and 2000. Suzhou, the cradle of Wu culture, has been recognized as one of the oldest towns in the Yangtze Basin. 2500 years ago in the Late Shang Dynasty, local tribes calling themselves "Gou Wu" lived in the area became the modern city of Suzhou. In 514 B.C.E., during the Spring and Autumn Period, King Helu (闔閭/阖闾), of Wu established "Great City of Helu," the ancient name for Suzhou, as his capital. In 496 B.C.E., Helu was buried in Huqiu (Tiger Hill 虎丘). In 473 B.C.E., Yue defeated the kingdom of Wu. The golden era of Suzhou ended with that conquest. Remnants of the civilization include the ruins of the 2,500 year old city wall and the gate through it at Pan Gate. The Chu, a kingdom to the east, in turn annexed Yue in 306 B.C.E. By the time of the Qin Dynasty, the city went by the name Wu County. Xiang Yu (项羽) staged his historical uprising here in 209 B.C.E., which contributed to the overthrow of Qin. During the Sui Dynasty, in 589 C.E., the city name changed to Suzhou. With the completion of the Grand Canal, Suzhou found itself strategically located on a major trade route. In the course of the history of China, it has been a metropolis of industry and commerce on the south-eastern coast of China. During the Tang Dynasty (825 C.E. ), the great poet Bai Juyi (白居易) constructed the Shantang Canal (called "Shantang Street" or 山塘街) to connect the city with Huqiu. In 1035 C.E., famed poet and writer Fan Zhongyan (范仲淹) founded the Temple of Confucius, which became the venue for imperial civil examinations. In February 1130, the advancing Jin army from the north ransacked the city and massacred the inhabitants. The Mongol invasion followed in 1275, destroying of the royal city (in the center of the walled city). With the advent of the Ming Dynasty in 1368 C.E., the city began a golden age. The gentry of the Ming and Qing dynasties constructed many of the famous private gardens. The city experienced devastation during the Taiping rebellion, when Taiping soldiers seized the city. In November 1863, the Ever Victorious Army of Charles Gordon recaptured the city from the Taiping forces. The Japanese invasion in 1937 presented the next crisis to strike the city. By the end of the war, many of the gardens lay in ruin. In the early 1950s, the government restored Zhuo-Zheng Yuan (Humble Administrator's Garden) and Dong Yuan (East Garden) to their former glory. In 1981, the State Council listed the ancient city as one of four cities (the other three being Beijing, Hangzhou and Guilin) as designated historical and cultural heritage sites. With that government designation and protection, Suzhou has developed into one of the most prosperous cities in China. 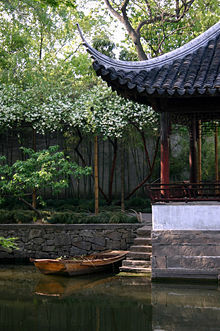 Classical gardens in Suzhou were added to the list of the UNESCO World Heritage Sites in 1997 and 2000. Pan Gate: A 2,500 years old edifice first built by the state of Wu in the Warring States Period. Renowned for its unique structure as a combined water and land gate. Xuanmiao Guan: Originally built in 276 C.E., rebuilt in 1584. Huqiu Temple: Originally built in 327, rebuilt in 1871. Cold Mountain Temple (Hanshan Si)  Built in 503, destroyed and rebuilt many times; last reconstruction in 1896. Baodai Bridge: Originally built in 816, rebuilt in 1442. Shantang Canal: Built in 825. Yunyan Pagoda: Built in 961. Ruiguang Pagoda: Built in 1009. Lingering Garden (Liu Yuan): Built in 1525, rebuilt in 1953. Master of the Nets Garden (Wang Shi Yuan): Built during the Song Dynasty. Blue Wave Pavilion (Canglang Ting): Built in 1696. Lion Grove Garden: Built in 1342. Humble Administrator's Garden (Zhuozheng Yuan)  Built in 1513, rebuilt in 1860. Gate of the Orient: The city's tallest building. Suzhou Museum: Contemporary museum built by architect I. M. Pei. No.1 Suzhou Silk factory: The first silk factory in Suzhou. The Suzhou region has won fame for a number of cultural highlights, among them Chinese opera. Kunqu originated in the Suzhou region, as did the Suzhou Opera more recently. Ballad-singing, or Suzhou pingtan, constitutes a local form of storytelling that mixes singing (accompanied on the pipa) with portions in spoken dialect. Suzhou has long been renown for silk production, especially Suzhou Silk Hand Embroidery Art. Other outstanding crafts include Suzhou embroidery, fans, national musical instruments, scroll mounting, lanterns, mahogany furniture, jade carving, silk tapestry, traditional painting pigments of Jiangenxutang Studio, the New Year's wood-block prints of Taohuawu Studio. Artistic accomplishments include Paintings and Calligraphic art. Cuisine, especially Yangcheng Lake huge crab, have attracted praise. Suzhou singers create "Jasmine," a song sung by Chinese singers or actresses thousands of times on the occasions of almost every important meetings or celebrations. Jasmine is the symbol of Suzhou, as is Tai Hu Lake. "Born in Suzhou, live in Hangzhou, eat in Guangzhou, and die in Liuzhou. "—Chinese saying. Suzhou's economic growth into one of the most prosperous cities in China has, in turn, fostered the growth of its satellite cities, most notably Kunshan, Taicang, and Zhangjiagang, which form the greater Suzhou region. Suzhou and its satellite cities host a growing number of high-tech development enterprises. 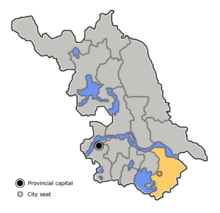 County-level cities: Changshu 常熟, Taicang 太仓, Kunshan 昆山, Wujiang 吴江, and Zhangjiagang 张家港. South El Monte, California U.S.
Suzhou is located on the Jinghu Railway linking Shanghai and Nanjing, the provincial capital, with hourly railway service. Suzhou Railway Station has one of the highest passenger traffic in China with 139 trains daily. T-Trains only take 45 minutes to Shanghai and an hour and half to Nanjing. Driving options include the Jiangsu-Shanghai Expressway, the Yangtze Riverine Expressway, the Suzhou-Jiaxing-Hangzhou Expressway. In 2005, the new Suzhou Outer Ring linked the peripheral county-level cities of Taicang, Kunshan, and Changshu. By water, Suzhou is connected with Zhangjiagang, Luzhi, Liujia and Changshou. The Suzhou Metro serves the city while undergoing expansion. Although Wuxi Shuofang Airport and Guangfu United Airlines Airport serve as two municipal airports, and the State Council approved of the construction of an airport exclusively serving Suzhou in 2003, air transportation from Suzhou continues to be at Shanghai Hongqiao International Airport and Shanghai Pudong International Airport in Shanghai. The Yunyan Pagoda, or Huqiu Tower, a tower that is now leaning due to lack of foundational support (half soil, half rock), built during the latter part of the Five Dynasties and Ten Kingdoms era (907-960 C.E.). The "xi shi" stone bridge. Painted map of Master of the Nets Garden. The Beisi Pagoda of Suzhou, built between 1131 and 1162 during the Song Dynasty (with later renovations), 76 meters (243 feet) tall. 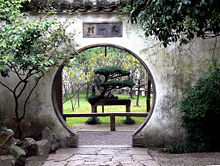 An exhibition of Penjing in one of the gardens in Suzhou. ↑ David Levinson and Karen Christensen, Encyclopedia of modern Asia (New York: Charles Scribner's Sons, 2002), 168. ↑ Kevin Bishop and Annabel Roberts, China's Imperial Way: Retracing an Historical Trade and Communications Route from Beijing to Hong Kong (Hong Kong: Guidebook Co., 1997), 25. ↑ Immanuel Chung-yueh Hsü, The Rise of Modern China (New York: Oxford University Press, 1970), 300. ↑ Changjian Guo, Jianzhi Song, and Lingyu Feng, World Heritage Sites in China (Beijing: China Intercontintal Press, 2003), 150. ↑ World Heritage Tour, Suzhou. Retrieved September 5, 2008. ↑ Travel China Guide, Tiger Hill. Retrieved September 5, 2008. ↑ Travel China Guide, Hansan Temple. Retrieved September 5, 2008. ↑ Travel China Guide, Lingering Garden. Retrieved September 5, 2008. ↑ Travel China Guide, Canglang Ting. Retrieved September 5, 2008. ↑ Travel China Guide, Humble Administrator's Garden. Retrieved September 5, 2008. Bishop, Kevin, and Annabel Roberts. 1997. China's Imperial Way: Retracing an Historical Trade and Communications Route from Beijing to Hong Kong. Hong Kong: Guidebook Co. ISBN 9780835125994. Guo, Changjian, Jianzhi Song, and Lingyu Feng. 2003. World Heritage Sites in China. Beijing: China Intercontintal Press. ISBN 9787508502267. Harper, Damian. 2002. China = Zhongguo. Melbourne, Vic: Lonely Planet. ISBN 9781740591171. Hsü, Immanuel Chung-yueh. 1970. The Rise of Modern China. New York: Oxford University Press. OCLC 67195. Levinson, David, and Karen Christensen. 2002. Encyclopedia of Modern Asia. New York: Charles Scribner's Sons. ISBN 9780684806174. Official site of Suzhou City, in English (Government of Suzhou). Suzhou city guide with open directory (Jiangsu Network). This page was last modified on 6 November 2015, at 23:46.